We were packed up and away from the campground at 7.20am Monday morning after four memorable days at the Penfield Historic Field Days. After the crowds and the many stalls and exhibits, it was strange to see the area almost completely desolate, just tracks where the parade had travelled and the few like ourselves who were making their departure. Travel arrangements do not always go to plan – it had been decided to ‘make some miles’ to allow more time for sightseeing in Nashville. All was progressing more to less to plan when the traffic turned into a car-park as a result of a fatal accident some mile or so in front of us. For 2 ½ hours the only progress was to replace those vehicles which had turned around! 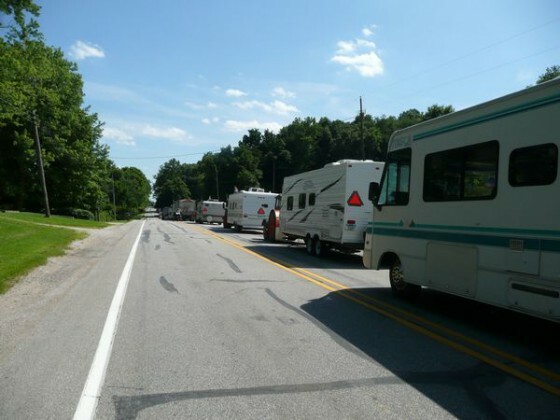 When the road was eventually reopened, our group was separated and the front-runners continued on to Bedford while three vehicles diverted to Heltonville where we had a RV Park booking at a picturesque national park forest. To end the day off, one of our tractors had a flat tyre !!! The good news of the day was that JEFFS9G had made a full recovery and was heading towards us, expecting to catch up in a day or so. Wendy and Jeff Fordham and Jeff Smith arrived from Australia near the end of our stay at Penfield and Jeff and Cumber were able to organize a lift back to Stryker where the tractor had been undergoing repairs. We look forward to having a full contingent of five tractors again very soon. Those of us who had stayed at Heltonville made the trip into Bedford to catch up with the balance of the crew at the Wal Mart Store. Morning tea seemed like a good idea, and soon it was 10.30 and we were late getting under way. 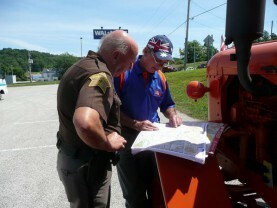 A quick trip to Paoli and a chance to check out the best route options with Joe, a local Sheriff. This conference resulted in the choice of route 150 which was a two-lane road with fairly heavy traffic. This necessitated many stops to prevent the backlog of traffic and the day was suddenly behind schedule. The route was scenic down 31W, but the weather was very hot and we were all very glad to reach our chosen destination of Cave City quite late in the day. Word from Cumber and Jeff was that they camped up for the night and should catch up Wednesday. 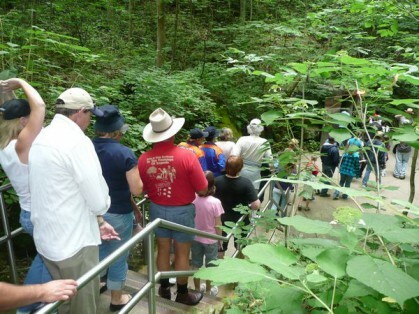 Today was planned as a sightseeing day, so everyone was up early and away at 8.30am to visit the Mammoth Cave. 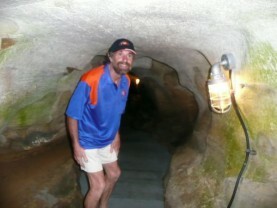 The two hour tour was extremely well organized and the cave quite spectacular – the longest cave system in the world. The two motor homes were used to convey the group, leaving the tractors at the RV Park in Cave City. Cumber and Jeff had arrived into the park by the time we returned, so after a quick lunch we all headed off to Bowling Green to meet up with Linda Dickerson who has kindly offered us host us for a dinner and overnight accommodation at the Kentucky University Agriculture Department facilities. 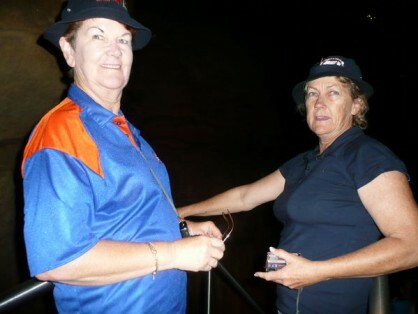 We arrived at 3.30 pm and were enthusiastically welcomed by Linda. The tractors were parked in the Equestrian Arena where quite a few local residents visited and then the Mayor of Bowling Green, Elaine Watson, visited and made us very welcome, presenting Ron, on behalf of the group, with a ‘Key to the City’. A sumptuous dinner followed – melt in the mouth steaks and an array of veggies and salad, all beautifully presented with floral arrangements and hay making the table very ‘country’. Two of the local ladies had made a special treat for us – fried apple or cherry pies, served with home-made ice creams from Chaney’s Dairy Barn. Another visitor was Christi Marksbury, from the Kentucky Agricultural Development Fund, who gave us information about the subsidies paid to encourage local agricultural producers from tobacco industry levies. All in all, a really enjoyable meal and event.